Award-winning screenplays have life-like characters. This means your script should have a hero and villain that seem like real people. 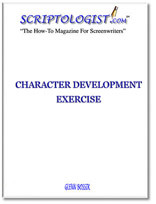 Scriptologist.com's step-by-step character development exercise will show you how to create the believable characters that Hollywood loves. How to give your screenplay a hero who will make your story seem as if it were a real-life event. How to give your screenplay a villain who makes your story suspenseful and compelling. How to use your screenplay's characters to create a main conflict that moves your story toward an earth-shattering climax.